A couple years ago, a friend invited a bunch of folks over for a barbecue and, naturally, beers were involved. Everyone was to bring cans of beer, and flush with a couple cases of Heady from the original Operation Cheddar, I naturally opted to share the wealth. Much beer was had, I ate some great pulled pork (courtesy of The Dogs of Beer), a French press and full leaf hops appeared, and merriment was had by all. 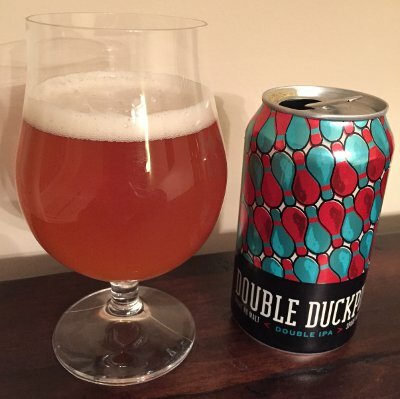 Beer Nerd Details: 8.5% ABV canned (12 ounce). Drank out of a tulip glass on 12/5/14. Between this, 077XX, and The Shape of Hops to Come (not to mention old hats like Victory and the one-off masters at Tired Hands) we're in pretty good shape with the DIPAs over here. Between Tired Hands and Forest & Main, we're hitting the saisons and sours pretty hard too. 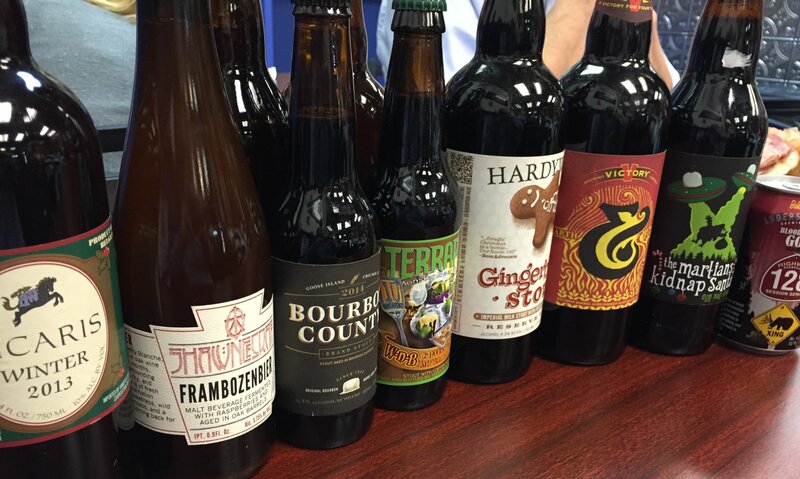 Now we just need to step up our bourbon barrel stout/barleywine game, and we'll really be rolling in it. For the five of you who read this blog and feel like commenting, I have an issue. The Google login doesn't seem to be working. There's no obvious solution to the problem, but I'm working on it. I posted more details at my generalist blog, but I just wanted to let you know that if you want to post a comment, Google isn't working. Wordpress and the other options seem to still work fine, if that matters. I apologize for any inconvenience and promise that the person or persons responsible will be sacked. Beer Nerd Details: 10.5% ABV bottled (750 ml capped). Drank out of a snifter on 12/5/14. A disappointing development from a beer I had high hopes for. In truth, infections happen to the best of them, so if this comes around again next year, I'll probably give it another shot. And what the hey, I'll probably be drinking more Frambozenbier too. Keep your chin up, ShawneeCraft! The conventional beer nerd line about lambic seems to indicate that only Cantillon and Drie Fonteinen are worth buying. That may be unfair (both make wonderful beer), but try finding a bottle of either that is not absurdly overpriced at a bar (and they'll make you open it at the bar too - no takeout). I would also put Guezerie Tilquin in that upper tier and I'm pretty sure that the only reason it's not is that people are so sick of overpaying for Cantillon and 3F that they don't want to acknowledge Tilquin's greatness, least they fly off the shelves, never be to seen again. Because I have, like, three regular readers, I have the luxury of not worrying about such things. Regardless, the notion that only those three brands are worth checking out is patently ridiculous. 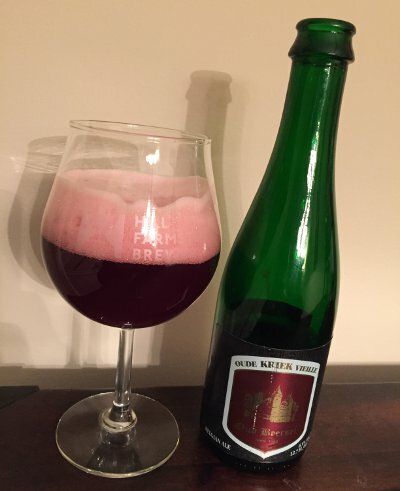 It's true that most anything you get from them will be fantastic and worth the stretch (and even worth, sometimes, the price gouging you get at restaurants), but there's a pretty reliable second tier of lambic producers that are worth seeking out. Think Boon's Marriage Parfait line or Girardin's Black Label, amongst others. Oud Beersel certainly fits that mold as well. Beer Nerd Details: 6.5% ABV bottled (375 ml caged and corked). Drank out of a Charente glass on 11/29/14. Best Before: 18.04.2032. 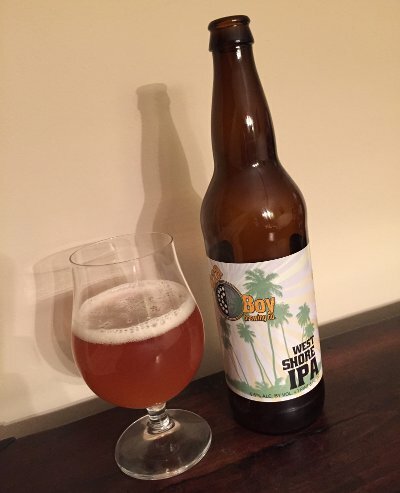 Beer Nerd Details: 6.5% ABV bottled (22 ounce bomber). 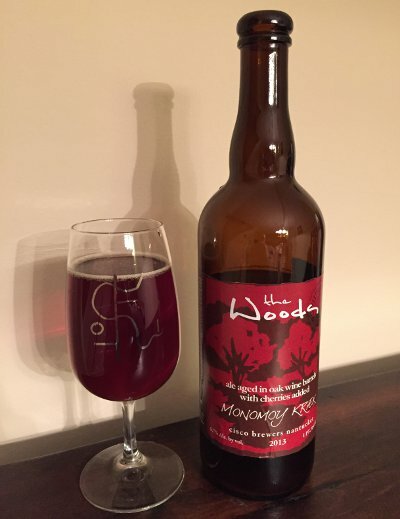 Drank out of a tulip glass on 11/28/14. This is pretty emblematic of all the stuff I've had from Pizza Boy - really solid and well worth trying. I need to get out there someday and sample their sours, which seem to have a pretty good reputation. Until then, I'll just have to make due with their distributed offerings! Beer has a reputation. It's the drink of the working class, and as such, many of the craft beers out there play up subversive or lewd aspects in their marketing. Indeed, this is part of the appeal of craft beers, an indicator of non-snobbery. Unfortunately, this often translates into horrible names or sexist labels, but Firestone Walker managed to walk a fine line with this one. 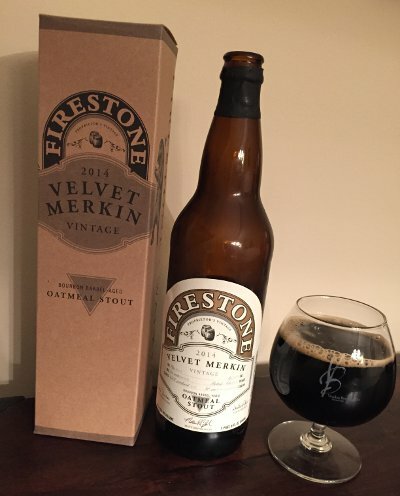 As the story goes, Firestone Walker had frequently released a tap-only oatmeal stout called Velvet Merkin back in the day. They changed up the recipe frequently and once they settled on something they really wanted, they had trouble getting the label approved (for the uninitiated, a "Merkin" is a pubic wig!) So in 2010 they pivoted and released the beer, a svelt 5.5% ABV Oatmeal Stout, as Velvet Merlin. However, they continued to try and get the Velvet Merkin name approved, this time applying it to an amped up, barrel aged version of Velvet Merlin. What we end up with is the current incarnation of Velvet Merkin, an 8.5% ABV oatmeal stout aged in a variety of barrels (the 2014 vintage used Elijah Craig and Woodford Reserve bourbon barrels as well as some Rittenhouse Rye barrels). So yes, a little crude, but Firestune's packaging is it's usual classy self, and the inclusion of a little grey triangle is actually quite brilliant - this is my kinda lewd and subversive. Beer Nerd Details: 8.5% ABV bottled (22 ounce bomber). 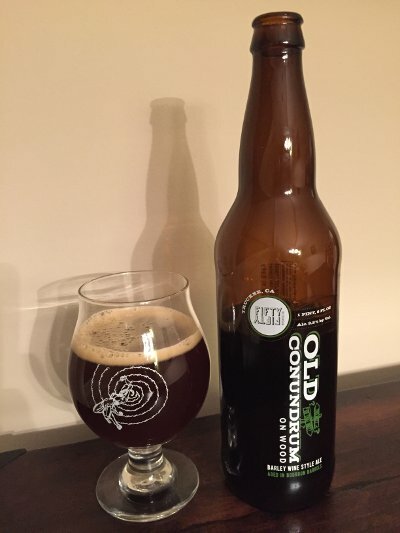 Drank out of a snifter on 11/25/14. Vintage 2014. I can't say as though I'm disappointed by this beer, but it's definitely not quite the amazing I was hoping for and expecting. That being said, Firestone Walker's barrel program is still held in high esteem here at Kaedrin, and you'll be seeing a couple more barrel aged wonders form these folks in the near future. Stay tuned! 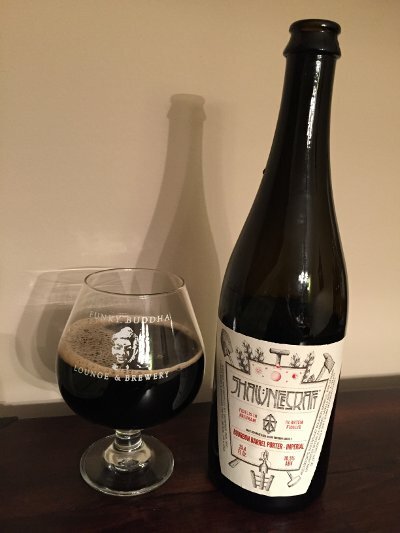 We're big fans of Truckee, CA's FiftyFifty Brewing, particularly the barrel aged variants of their Eclipse stouts. Each uses the same base stout recipe, but is then aged in a different expression of bourbon (or rye) barrel. There's a surprising difference in each variant and it's a fascinating (if wallet lightening) exercise to work through them. Beer Nerd Details: 9.8% ABV bottled (22 ounce bomber). Drank out of a snifter on 11/22/14. 2014 vintage. They also make a blonde barleywine aged in bourbon barrels called Annularity, though I have not secured one of those bottles (and to be sure, I've found that lighter colored beers and bourbon barrels are not always the most enticing prospect for me... not that I'd turn it down, to be sure!) Here's to hoping I get to snag more Eclipse variants this year! 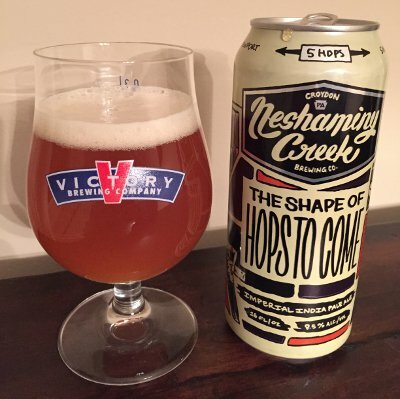 Beer Nerd Details: 9.5% ABV canned (16 ounces). Drank out of a tulip on 11.21.14. Supposedly, an earlier batch clicked in at only 8.5% ABV, which sounds almost perfect to me at this point. A slightly less boozy version of this beer would be local royalty. As it is now, it's still pretty damn popular. Pick up a can now while you can. Totally worth it.